| Videos DVDS | Jerseys Posters Games | Mags Books | Tickets New! Products! STILL AVAILABLE TO FANS AFTER THIRTEEN YEARS! It was a wonderful time for America and an historic moment for Soccer. The world's most popular sport (called futbol everywhere else) had arrived on a global scale in the United States. 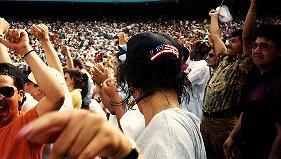 With the hosting of World Cup 1994, soccer was shifted to a higher level of awareness amongst Americans. 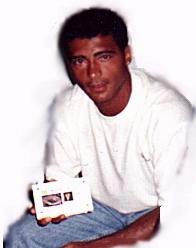 This American was introduced to Pele's "beautiful game" at World Cup level for the first time in 1994. Nothing in the world can acurately describe the feeling I had seeing first-hand thoses waves of hands, the roar of the crowds, songs, and chants of Olay..Olay.. Olay!..Olay.! It didn't really matter to me which team was playing, because I was as much fascinated as much by the crowds as I was the skill of play on the grass. If you were an Italian-American you were Italian on that day. 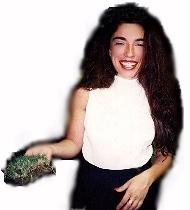 If you were a Brazilian-American you were Brazilian ..and so on. It was a remarkable display of support for one's ancestry and heritage. Costumes, a sea of beautifully painted faces, and flag draped bodies were everywhere. Yes, soccer had truly arrived in America!. Of course you could say that it (soccer) was here long before, with the appearance of the Cosmos and flashes of brilliance from an aging Pele, but never before had this entire country had an opportunity to see the greatest players on earth first-hand and all for the relatively small price of a ticket..
With the games fading away, I wanted to purchase a t-shirt or hat to remind myself of this wonderful experience called World Cup. . There were certainly enough arouind. Everywhere I went I purchased a shirt or a cap. 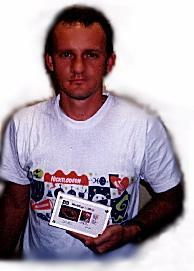 However, no matter how many caps or shirts I collected I felt that I needed something different.. Afterall, even to this day over (4 years later), there are t-shirts from '94 still out there to be purchased. And that's just the point! Those type of momentos are great, but fact is, their abundance and availablity make them for me somewhat "common". I needed something else; something that was more symbolic of the game itself. Something more unique. Then it came to me.. "The Grass!!!" I thought , "What about the grass!!?" Isn't the grass one of the most important aspects of the game? Didn't the World Cup venues particularly Giant Stadium (left) spend more than $2,000.000 dollars to install a natural grass surface over astroturf? 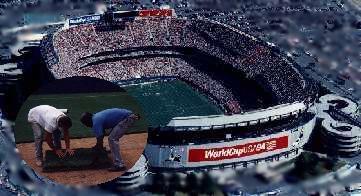 And in Detroit Michigan (below), a similar amount was spent growing, delivering and installing a natural grass surface inside the Silverdome. 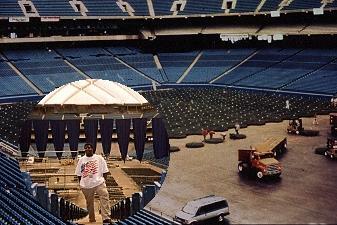 In the Silverdome, they used a tray system to acommadate the first ever indoor World Cup Game. There were countless newspaper articles written about both of these unique World Cup playing surfaces. In fact, all of the other venues including the Rosebowl at Pasadena had their pitches, lengthened, widened, leveled or modified in some way to accomadate World Cup regulations . It was crucial to develope specific blends or mixtures of turfgrass which would facilitate moderate growth, while minimizing wear and tear during the rigorous play. Thus it seemed to me that the most important (allbeit taken-for- granted) component would an ideal collectible even for the players and officials of the World Cup. You see, as millions of people are viewing the world's greatest soccer players on the earth they are also looking at the most important lawn as well right?...Oh well.. I couldn't think of a more natural choice for a souvenier. But fans collecting the grass after games is not really that unique. I had seen old footage of previous World Cup games where the fans literally ripped the grass out of the ground at the end of game. 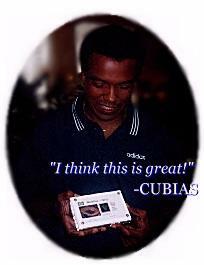 After Italy '90 a company was putting whole squares of sod in cubes and selling them. At the conclusion of the recent games at the Silverdome, the grass was given away as souveneirs, with the bulk of the field being donated to create a soccer field at Bell Isle Park ilocated in the suburbs of Detroit. 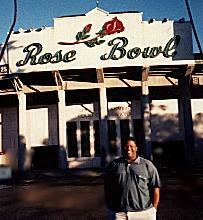 The Rosebowl organizers also gave away the sod, and Giant Stadium,in New Jersey was not much different. The lines there were long with people waiting to take home a piece of sod upon which Roberto Baggio and Italy won their semi final match before facing eventual winners Brazil. 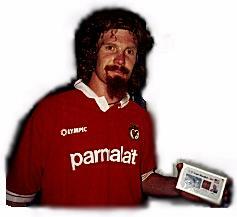 You should have seen the look of joy on my face when I approached the marketing division World Cup 1994 who granted me permission and an official license to distribute authentc posters, certficates, and acrylic blocks all containing a single blade of preserved grass extracted from the playing surface of WC94. It was sheer ecstasy. 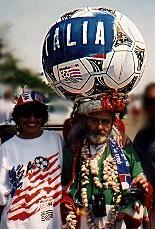 I had thus developed a grassroots way of sharing the joy of World Cup (and a piece of America) with the world! 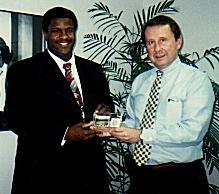 At left - Todd Schindler Intl Marketing Dir holding prototype containing preseved grass from WC'94. Not only a piece history but a work of art! 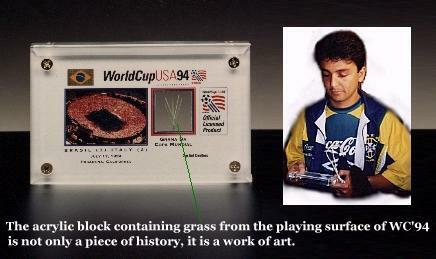 It wasn't enough for me to be able to collect and preserve the grass from America's first World Cup. I wanted to learn more about the playing surface of the world's most popular sport. During the course of my research, I would interview some of the greatest stars of World Cup past and present such as legends Teofilo Cubias , Peru - (World Cup '70,'78, & '82) left, the great Eusebio, Mozambique - (World Cup 1966), lower right and the greatest player of all time PELE. (lower left). I compiled an enourmous amount of technical information, interviewing everyone from stadium grass maintenance personnel, to the President of FIFA Joao Havelange. 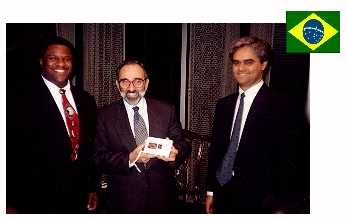 Dr. James Watson Chief Agronomist of World Cup 1994 and Dr. John N. Rodgers III provided me with an enormous amount of technical information. It was they who were directly responsible for overseeing the special projects at Giant Stadium and the Detroit Silvderdome. However, as my interest in the grass of World Cup and soccer stadiums became more intense I conducted further reasearch on the subject eventually inspecting the grass surface of Maracana, stadium in Brazil, the world's largest and site of World Cup 1958. (Story will appear in a future edition of "La Cancha.") While in Brasil, the largest newspaper O'Globo wrote an article entitled "A grama historica" (The Historic Grass). 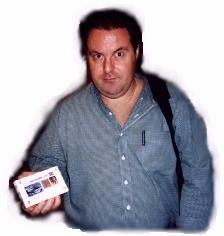 I was interviewed by Brazil's other major publications including "Jornal do Sports" and "Jornal do Brazil". Thus, with a little engenuity, hard work and a lot of luck, a simple "grassroots" idea for a unique souvenier became a reality. Some have said that what was produced is the most unique World Cup related momento ever. 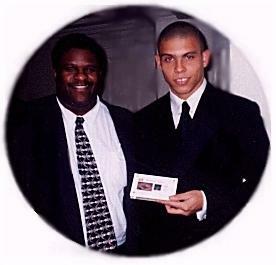 As you have seen in this, and previous articles, the greatest coaches and players in the world including Brazil's fabulous Ronaldo (left) and Bebeto (below) were presented not only with a souvenier but a piece of world cup related history. 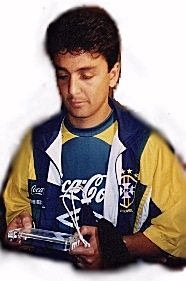 Just ask Bora Multinovic, Mario Zagallo, Carlos Alberto Parreira, Pele, Romario, Bebeto, Zinho, Branco, Mauro Silva, Cafu and Taffarel what it meant for them to recieve this wonderful momento. It was after all, the first time that any country had won the World Cup for a fourth time. 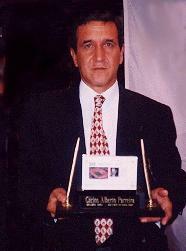 Upon receipt of the acyrilic block containing the turf coach Parreira remarked " This is a wonderful momemto, something I will keep in a very special place in my home and cherish always". 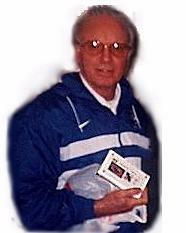 Current Brazilian Coach Mario Zagallo (below left) simply remarked , "This is one of the most unique things I have ever seen." You may still be asking, why the grass? Well, we chose to preserve the grass because it is one of the most important components of World Cup level play and as such is a natural symbol of the game. FIFA rules require that all World Cup level games be played on natural grass. 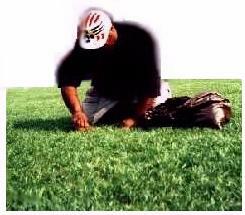 Many of the world's greatest coaches and players told me how the quality of a grass surface can affect their players. How many times has even a most highly regarded team lost to a lesser opponent merely due to the condition of the playing surface ie (wet from rain, holes, etc). 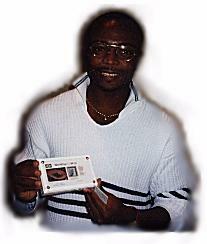 Thus, the preservation of grass extracted from the playing surface of World Cup 1994 was a natural choice in the creation of a momento designed for fans as well as World Cup players and officials. The grass of World Cup 1994 was not only an integral part of the game but dressed in whiite lines, "the field" or "La Cancha" becomes the symbol of the sport itself. Throughout World Cup 1994 and now during France '98, you've heard America's most famous announcer Andres Cantor (right) use the term 'La Cancha" many more times than even than his own famous shout of "Goooaal!" THE SIGNIFICANCE OF "LA CANCHA"
Unlike local games where mistake on the playing field ("la cancha" ) is a mere mistake, a mistake on a World Cup field has cost men their lives. Following World 1994, a Columbian player was killed due to an "own-goal" committed on this grass.. The outcome of a match on this grass can mean either misery or ecstasy for an entire country. Most times however the field (La Cancha) is a dirt patch, beach, and even a dirt road. For the children of South America and elsewhere, any place an object can be kicked along the ground becomes la cancha. 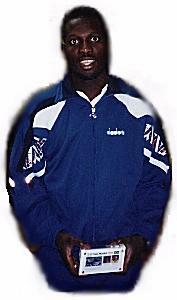 Thus in 1994 we set out to further study the playing surface of the greatest sporting event in the world...World Cup. Hence began the idea to create not only the most unique momento of all time, but to also publish the world's most unique magazine on the subject. Now, let's take a look at how this historic grass owas preserved, who else has it, and how interest is growing world wide amongs fans to obtain it as a collectible item. PRESERVING THE TURF - "Preserving History"
The grass extracted from the playing surface of America's first World Cup was placed in large boxes and shipped overnight to a laboratory in the midwestern United States. There, it was placed in trays and treated with a special substance to aid the preservation process. The trays were then placed in a special machine whose function was to complete the process. 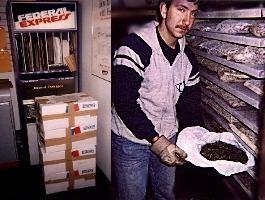 After preservation was completed the turf was shipped back to us via air. In most cases a single blade of this historic grass was affixed upon the lower portion of posters depicting the World Cup finals in progress. It was also attached in the same way to small certificates each item (poster or certificate) bearing written certification of authenticity. The most spectacular item however was a clear acrylic block containing the turf. 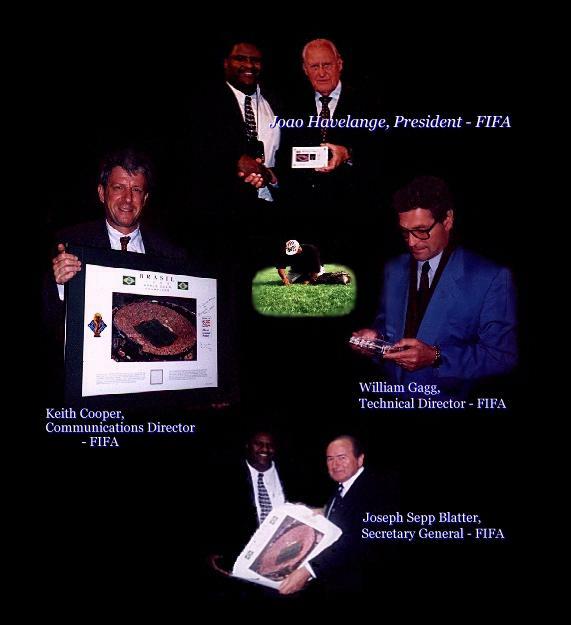 It was this acrylic block containing the turf that you've seen presented to FIFA president Joao Havelange and players of World Cup 1994. 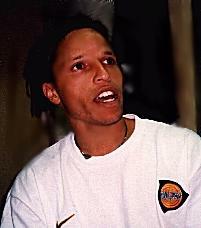 America's dynamic Cobi Jones remarked that it was a wonderful thing We were very proud when Alan Rothenberg president of World Cup 1994 said "I'd really like one of those myself!". By the way, this was the first time ever that the World Cup organization licensed the use of it's official symbols in connection with the grass from the games. So for us this was an opportunity to makeWorld Cup history. As Brasil won the World Cup for an unprecedented fourth time I though it appropriate to present the turf to the people of Brazil as a whole, doing so as a Christmas present. But how does one with limited financial resources do such a thing. 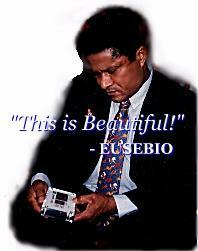 Then it came to me, I thought, all I had to do was present the turf to the representative of the Brazilian people, the Ambassador of Brasil, Carlos Fletcha de Lima in Washington D.C. After numerous phone calls and faxes to the Brazilian Embassy, arrangements were finally approved to actually meet with the Brazil's Ambassador! Ironically, embassy staff members were decorating the official banquet hall and placing other gifts under their Christmas tree. So I guess my timing could not have been better. 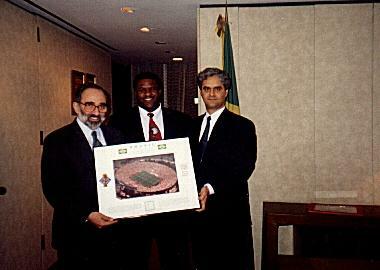 The Ambassador would receive the World Cup Turf on behalf of the Brazilian people as a Christmas gift. 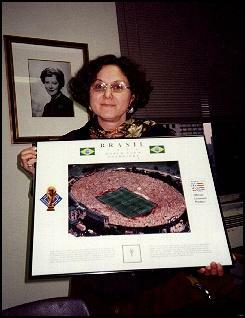 Maria Teresa Pessoas, Deputy Consul General of Brasil in New York (left ) was also presented with items containing the historic turfgrass which was officially recognized as "World Cup Turf." Deputy Consul General Pessoas remarked, "This is a very proud moment for me, to receive these gifts on behalf of the Brasilian people living in New York. They will be permanantly installed in the Consul General's office so that Pele and every Brazilian dignitary visiting New York can view and.enjoy them." Chief of Staff Fonseca (above) remarked, "We thank you on behalf of all Brasilians living here in the United States and abroad." 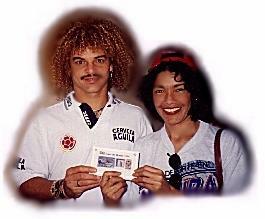 Taffarel, Romario any other champs simply said, "It's Fantastic!" 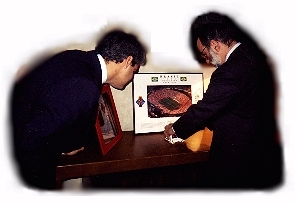 Within the next few years , the preserved grass fromWorld Cup 1994 would ultimately be presented to Brazilian National Team coaches Carlos Alberto Parriera (Above left) , and Mario Zagallo as well as Romario, (Right) Bebeto, Zinho, Branco, Mauro Silva, Taffarel (left), and current members Flavio Conceicao, Roberto Carlos , and Ronaldo. Aside from the champions of World Cup 1994, numerous other reknowned players and officials would receive the turf during the course of the next few years. It was during this developemental stage of "La Cancha" the magazine that we would conduct numerous interviews with these players focusing of course on the playing field. .The players gave us their unique insight and opinions as to to the significance of a "quality" prepared playing surface. We would learn how grass height affected speed of the ball, and the energy level of the player. Pele's coach Eddie Firmani would remark however that it didn't matter what type of surface Pele played on his performance would always be superb. But nonetheless, most World Cup level players insisted that the playing surface makes a difference most preferring a low cut dry playing surface. In exhange for their valuable insight we presented the players, coaches and officials with an actual piece of turf from World Cup 1994 encased in a clear acrylic block. The greatest player of all Pele would indicate that it was one of the most beautiful things he had ever seen.as well. Other World Cup players who have remarked on the turf's beauty include Stefan Efenberg (Germany), Hristo Stoickov, (Bulgaria), Carlos Valderama (Columbia), Roberto Donadoni (Italy) Jorge Campos (Mexico), Tomas Brolin (Sweden) , Abedi Pele (Gana) at right, and George Weah (Liberia) above. Coaches Bora Mutinovic and Steve Sampson (U.S.A) would also marvel at the acrylic blocks as would former Brazilian coach Carlos Alberto Parreira and current coach Mario "Lobo" Zagallo. Reporters from the major networks which covered the games were equality impressed with the the prints and acrylic blocks containing the turf from Brasil's historic 4th World Cup victory. Whether speaking with the "golden voice of World Cup" Univision's Andres Cantor here in the U.S., meeting with the TV and printed press in Brazil, or showing it to soccer fans at games, the reaction has always been the same. "Wow!". For nearly THIRTEEN YEARS!, the preserved grass from the playing surface of World Cup 1994 has been secured in an electronically protected self-storage bin. Periodically we have inspected it and as expected, to this day, it remains as green as it was when it first returned from the perservation process. We are excited to announce that will now distribute a piece of the actual turf from World Cup '94 attached to posters certificates, and encased in clear acyrlic blocks as seen above. . We suggest however that you E-mail us now and add your name and address to the growing list of people world-wide who have already requested a piece of this historic grass. 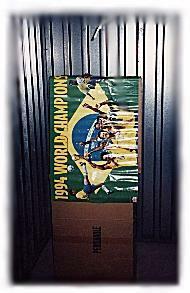 The preserved grass attached to posters, and encased in acrylic blocks will be the same turf presented to Pele, Ronaldo, Romario, Cafu, Bebeto, Taffarel, Mauro Silva, Branco, Zinho, Brazilian Coaches Carlos Alberto Parreira, Mario Zagallo, Joao Havelange president of FIFA and numerous other World Cup stars! click on image to visit the "World's Leading Soccer Magazine!